After first coming to prominence in a significant role in the first Hunger Games movie, Amandla Stenberg has kind of become a go-to actress for other YA novel adaptations, although her more recent fares into the genre have ranged from downright terrible (The Darkest Minds) to disturbingly misguided (Everything, Everything). But luckily, she is now in a position where she can use her apparently exclusive appearances in YA material to promote better causes in both film and real life, such as her outspoken political beliefs and coming out as gay earlier this year, which have earned her great respect and admiration amongst her fan base as well as liberal-minded activists trying to push back against the increasingly conservative government forces that are currently in power. It is her latest venture into YA territory, however, that is set to earn her even more praise, and it is fully deserved. 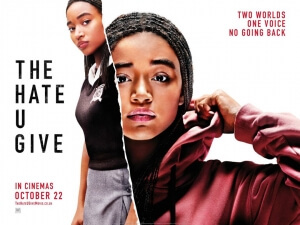 The Hate U Give, based on the novel by Angie Thomas and adapted by screenwriter Audrey Wells – who very sadly passed away a few days before this review was written – sees Stenberg star as, erm, Starr, an African-American teenager who lives with her family in an impoverished side of town, where jobs are scarce and drug dealing is one of the bigger industries in the area. Despite this, she attends a predominantly-white high school on the other side of town, where she alters her personality to fit in more with the white kids she hangs out with, including her boyfriend Chris (KJ Apa). One evening, at a party in her neighbourhood, she runs into childhood friend Khalil (Algee Smith) and spends some time with him, but when both are out driving they are pulled over by a white police officer, who shoots and kills Khalil when he mistakes his hairbrush for a weapon. Starr is left traumatised by the event, and as the African-American community demands justice for Khalil’s death, she is encouraged to find her voice and speak up for the injustice towards her people. Needless to say, this movie tackles some pretty heavy topics right from the start, including an opening scene where Starr’s father Maverick (Russell Hornsby) teaches his young children, one of them an infant, exactly what to do when confronted by a police officer in any scenario. From there, the film brings up several themes such as institutional racism, police brutality, gang violence, and the sheer hypocrisy of white slacktivism – the white students at Starr’s school use Khalil’s death as an excuse to skip school for the rest of the day – all in ways that are very carefully mapped out and executed by both Wells and director George Tillman Jr., who don’t shy away from showing some of the more upsetting sides of all these topics. It’s told in such an incredibly powerful way, causing emotional gut-punches when you see the raw injustice that Starr experiences throughout this movie, such as the inciting incident that sees her childhood friend murdered right in front of her, and also being subject to increasingly racist comments by her white school friend Hayley (Sabrina Carpenter), who at one point suggests she pretend a basketball is a piece of fried chicken, all of which bring out the anger and fighting spirit within her soul and cause her to stand up for her own identity as well as that of her family and friends. This isn’t an easy film to watch, and that’s meant as a compliment; the movie handles themes that ring all too true into today’s world, and as you’re watching all these things unfold the more you feel uncomfortable about how well it seems to be mirroring our society right now which, whether we like it or not, is still very deeply prejudiced towards minorities. Leading the film’s several causes with steadfast precision and perfection is the lead performance by Amandla Stenberg, who is utterly captivating and destined to break big once this movie finds its way to more audiences. She easily carries the whole thing on her strong and capable shoulders, brilliantly portraying her character’s slow but sure rise from obscurity to outspoken rights activist once she starts to become more public about demanding justice for her friend’s death. There are multiple close-ups of Stenberg’s face where you can clearly see anger brewing in her eyes, as well as that of overwhelming grief and guilt for all the injustices she has experienced in her life up to this point, nailing something that far too many young people nowadays feel whenever they see or go through unspeakable tragedies, from school shootings to injustice for victims of sexual assault to, indeed, police shootings based largely on the colour of a person’s skin. Stenberg, both in the film and in real life, is quickly becoming an inspirational figure in the ongoing battle for racial, gender and sexual equality, and with her breathtaking performance in this movie it seems all but guaranteed that she is going to end up with far more warriors on her side. It is a powerfully told film, with some excellent performances all around – outside of Stenberg, you have other actors like Regina Hall, Russell Hornsby, Common and Anthony Mackie all popping up to shine every now and then – but if I did have to point out flaws, it would be that the film probably has a running time that’s longer than it needs to be. There’s about ten or fifteen minutes of filler that the film would have honestly been fine without, and whole characters like KJ Apa’s Chris that could have been cut out of this entire movie, but their inclusion here doesn’t necessarily make the film worse; I just personally felt that the movie could have been trimmed down a little bit. The Hate U Give is a powerfully told YA drama which tackles several timely topics with careful precision and an outstanding lead performance by Amandla Stenberg, who is poised to break out big time following the release of this movie.